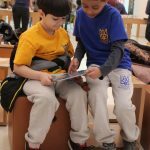 Yesterday started ACS’s kindergarten through eighth grade Apple Education field trips. 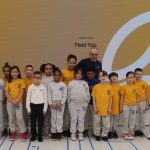 We started with third and fourth grade attending a coding class. 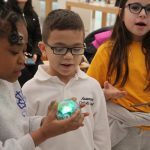 Since coding is essential to helping students thrive in a future driven by technology, teachers specifically selected this topic. 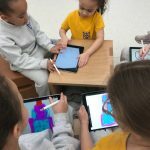 This program teaches skills like critical thinking and problem solving and is used in conjunction with the “Everyone Can Code” curriculum with lessons on using the iPad. 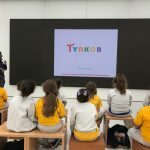 Today, Kindergarten and first grade were exposed to Tynker, an educational programming app that showed them how to make games and programs. Instead of typing the source code, you visually drag blocks of code and snap them together. Next, they used the Procreate app where they used the Apple pens to draw and create their favorite food and dessert. ACS is always looking for opportunities to introduce students to new concepts and technology. 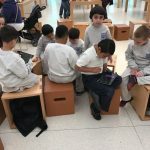 We will be incorporating what we have learned into our computer science curriculum in the fall. 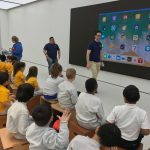 Stay tuned for the further Apple Adventures of Assumption Catholic School Students!